Microsoft Excel VLOOKUP - What would I use that for? At the start of a Microsoft Excel course I always ask people – “What do you Need to Know”. I’m trying to find out what each attendee wants to achieve from their time spent with me. Often the VLOOKUP function is mentioned. “I’ve heard other people talk about it, but I’m not really sure what it does”. You won’t be surprised to learn that it is designed to look things up! However, there are two distinctly different ways that it can be used. Down the left hand column of this table there are a set of Invoice Amounts. The next three columns show what discount a customer would be allowed (depending on which Rate they qualified for). Any customer who’s invoice amount is between zero and £999.99 would get 3.0% if they are on Rate1; 5:0% for Rate2 or 7.0% on Rate3. If the amount is between £1000.00 and £1999.99 the values are 5.0%; 7.0% and 10.0% respectively. The table sets up a “Banding Structure” so that three discount rate percentages can be found for any invoice amount. The first bit of that is important. The invoice amounts have to be in the first column of your table. I had a customer recently who couldn’t get VLOOKUP to work. After a bit of investigation, I found that he had put his list of “invoice amounts” in the third column. That just won’t work. The first two Arguments shouldn’t cause you too much trouble. It is the third one that can confuse. 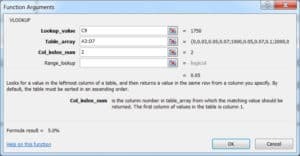 Col_index_num is the column number in table_array from which the matching value should be returned. 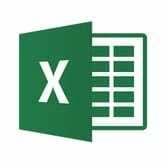 People are used to referring to columns in Excel by a letter – the values for Rate 1 are in column B of the worksheet. So why are we asked to enter 2? The point is that Excel wants to know that Rate 1 is in the second column of our table. It would make no difference if the table started at cell ZZ1000, the figure for Rate 1 is still in the second column; the correct Col_index_num would still be 2. Use =VLOOKUP(C9,A3:D7,4) to look up Rate 3 – because it is in the fourth column of our table. 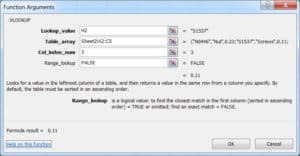 A totally different use of the function is to enter (say) a Part Number into one worksheet and use VLOOKUP to find a matching entry in another worksheet. Often this is used to extract more information (perhaps Description and Price) from the second sheet. So what is Range_lookup all about? In our first example, the Invoice Amounts are in ascending order. It is possible to type in a value of 1750 and get an answer. Excel looks down the first column of the table and when it gets to a number higher than 1750, it gives the percentage from the previous row. This can only work if the amounts are in ascending order. That is why I left Range_lookup blank (I could have entered TRUE). However, in the second example, the Part Numbers are not in alphabetical order. I need to put FALSE for the Range_lookup to make Excel look for an exact match – otherwise the function won’t give the correct answers. This does mean that if you enter a Part Number which isn’t in the list, Excel will return #N/A. VLOOKUP – What does the “V” stand for? So far the tables have been constructed so the Excel has to look vertically down the first column. That why I’ve used VLOOKUP. Notice that we are asked to supply a Row_index_num this time. The “Rate over 500 Miles” is in the second row of our table, so an entry of 2 is needed to extract it. Once again, it doesn’t matter that these values are in row 15 of the Excel worksheet – they are in row two of our table.